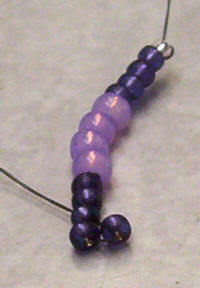 Begin by putting on a stopper bead (the silver one in the pic) then pick up 4 size 11, 4 size 8.0, and 5 size 11.0. Pick up another 11.0, and skipping one, go through the next. Again, make sure they are lying side by side nicely. 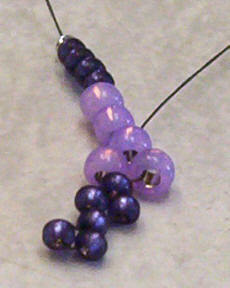 Now pick up one 8.0 bead, skip the next bead and go through the next one. 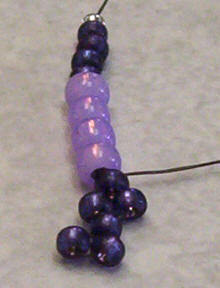 Add beads in this manner to the end. Putting an 8.0s over an 8.0s, and 11.0s over 11.0s. 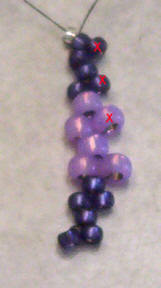 The red X shows the next beads added. Now just fill in the blanks to the end! Putting 11s over 11s, and 8s over 8s. Use even tension....not too tight, not too loose. If your piece starts to curl, straighten it out with your fingers and loosed your tension a bit. 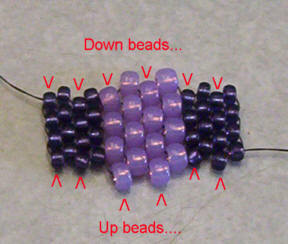 Keep adding rows until you have 4 beads on the end of each side. See how you have an 'up' bead in the first position on the beginning row, and a 'down' bead in the first position on the last row? 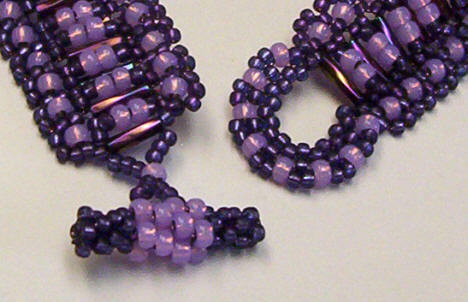 When the piece is rolled into a tube, these up and down beads will mesh together like a zipper! Then all you have to do is to stitch the two sides together by zigzaging back and forth between the up beads on either side. 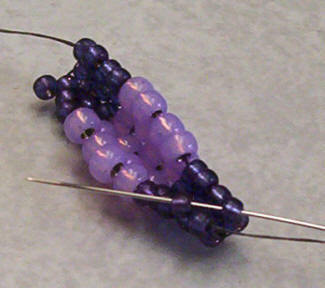 When you reach the other end, you can knot your working thread to your tail, then weave both ends in. 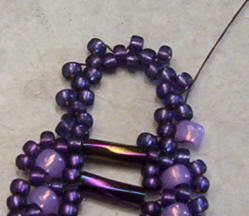 To attach your toggle, come out of the end of your bugle bead, pick up three size 11.0, one size 8.0 and three size 11.0. 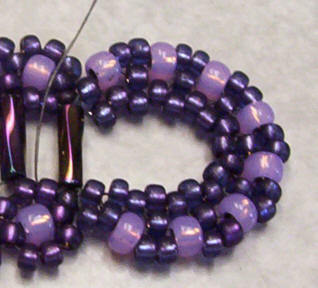 Go through the middle two beads in the toggle, then pick up three size 11.0, and go through the size 8.0 bead again. 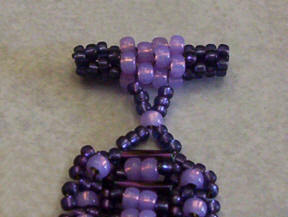 Then pick up three more size 11.0 and go through your bugle bead from the other side. Weave your ends in good and clip. With your thread coming out of the bugle, pick up 18 suze 11 beads, and go through the other side of the bugle. Pick up a bead, skip the first bead in the ring and go into the second. Pull tight so that the new bead is lying side by side with the first bead in the ring. Continue around the ring by picking up a bead, skipping a bead, and going into the next bead in the ring until you've added 9 beads. Go back through the bugle to be in position to start the 3rd row. Go up through the first bead you added on the second row and add a size 8.0 bead in the space next to the number 2 bead in the first row. 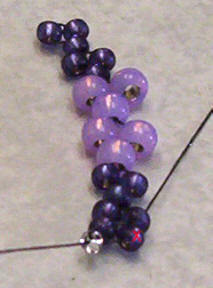 Fill in the spaces all the way around with size 8 beads, for a total of 8 beads. Go through the last bead in the first row, and back through the bugle to be in position to do your last row. 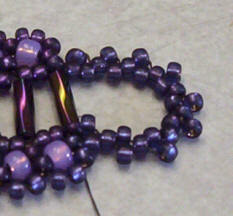 Now just go around again, starting after the first large bead, add two size 11 beads in the spaces. 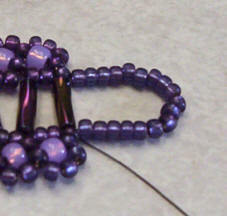 Go back through the bugle, and needle over through the first bottom bead of your daisy to start the embellishment row. Done! 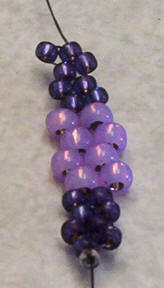 Design tip: For an even fancier clasp, try doing another round with picots!